A UNIQUE TURN KEY HOME. 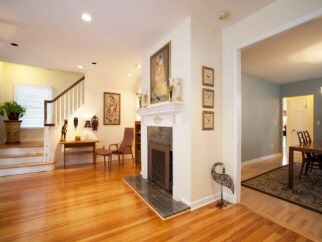 ONCE YOU ENTER INTO A HUGE ENTRY FOYER/MUD ROOM, YOU WILL NOTICE THE WARMTH AND LOVE OF THIS HOME. THE LIVING ROOM WITH FIREPLACE SETS THE STAGE LEADING INTO THE HUGE DINING ROOM THAT FITS 16 OR MORE FOR DINNER THEN OPENING INTO THE HUGE OPEN KITCHEN THAT YOU WILL DIE FOR!PLENTY OF WINDOWS AND A SIDE ENTRANCE WITH SLIDING GLASS DOORS TO A SIDE DECK. GRANITE COUNTERS WITH PLENTY OF COUNTER SPACE AND TOP OF THE LINE APPLIANCES.A HUGE GREAT ROOM WITH CATHEDRAL CEILINGS, SKYLIGHTS WITH DOUBLE SLIDING GLASS DOORS TO A HUGE DECK TO ENTERTAIN AND ENJOY YOUR PRIVATE BACKYARD. GOING UPSTAIRS YOU HAVE 4 VERY GOOD SIZE BEDROOMS WITH A MAIN BATH AND YOUR HUGE MASTER BEDROOM WITH A FULL BATH AND A HUGE WALK IN CLOSET.HARRINGTON PARK IS KNOWN FOR THE COUNTRY FEEL WITH 4 PARKS,A DOWNTOWN WHERE EVERYONE STOPS BY,PLUS THE BEAUTIFUL PARKS,TENNIS COURTS AND BLUE RIBBION SCHOOLS.